The 28' GTc is the latest in the Sport series and she is the largest model. This tender is admired for his livery, also available with bicolor tubes, but captures the attention especially to the original layout of the deck. This rib offers an exemplary habitability in all areas, from the pulpit at the bow to the long stern platforms. At the center of the hull, there is an impressive console, perfectly proportionate to the size of the rib. In the front, you can install a small table, but the most important and exclusive area is the stern living that has so many seats and unparalleled dimensions for a rib of this measure. The two sundeck areas are both very large. The one at the bow is extended till the seat in front of the console. The stern sundeck widens on coamings with comfortable headrests cushions. The driving position is not only ergonomic, but also very safe thanks to the handrail and the greatness of the windshield which shelters from the weather allowing to drive optimally even in tough conditions. The dashboard was designed to give the best location to all the controls and the instruments. You can drive standing, leaning or sitting and the co-pilot has also a footrest. The pilot bench is supported by a structure that can contain a locker, or an ice chest with a soft seat, or a refrigerator and an extractable bench and the owner can choose the desired configuration. The dressing room located inside of the console can be equipped with a toilet, a shower and a small sink. Although she is a big rib, the layout and volumes were studied maniacally, as on a small dinghy, to obtain lockers and storages everywhere. She was designed to install either one or two engines, up to 400 horsepower. 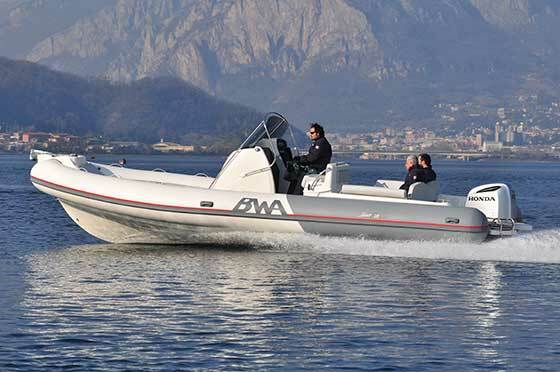 With a 250 horsepower outboard, the minimum planing speed is 12 knots and the consumption is just 0.8 nautical miles per liter up to 24 knots. The maximum cruising speed is 30 knots and she reaches 40 knots at full throttle.